The Stowaway models have always been Trident Trikes #1 seller. The Stowaway line offers an incredible component mix at a price other manufacturers can’ touch. Both Stowaway models use our Powder Coated 4130 Cro-Moly Tig Welded Frame, as well as Avid Brakes/ Promax Levers with Parking Brake, Double Wall Alloy Rims , and Ackerman Compensated Crossover Steering, but that is where the similarities end. The Stowaway II is our High Spec Model. It uses a Microshift Front Derailleur and a Microshift Marvo XE CNC Machined Rear Derailleur. Shifting is done with Bar End Shifters.The Brakes are Avid BB7’s.The Crankset is a High End Forged Crankset with CNC Machined Rings, and an Integrated Bottom Bracket. The seat frame, handlebar and boom are Sandblasted and Anodized Aluminum Alloy. For all you Short Crank Afficianados, the Stowaway II will also be available with 160 mm Cranks for an additional $50. 152mm Crankarms are also available by request as well as “Z” steering bars for extremely short X Seams. Longer Booms ($40 Additional) will accommodate riders up to 51″ X Seam. Both Stowaway models include our Aluminum Mesh seat with 3 adjustable seating heights, and 4 adjustable seating angles .standard .An optional adjustable neckrest is also now available on our accessories page. An improved Idler system that is as nice as anything on the market and a nicer Mirror. Stowaway 2 also has adjustable handlebars. New for 2017-: Schwalbe Trykers will be standard on Stowaway 2 Models, as well as replaceable Derailleur Hangers. Also in Stowaway models– we don’t charge you for the extras!! Also included with both models are a Rear Rack, a full set of 3 Fenders, a Safety Flag, a Mirror, and a Rear Light. Electric/Power Assist Trikes are the fastest growing segment of this industry. It is rare that a week goes by that we don’t get a call asking if we would do an E Stowaway with the Dapu Geared Hub System. We have actually built several for customers here at our shop over this past year. 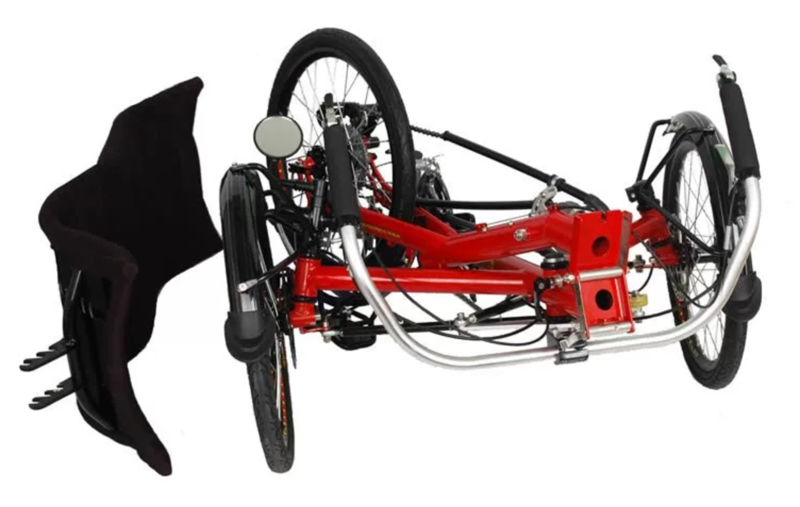 The E Stowaway will be equipped with 18 Speeds (2 x 9) as well as everything else Stowaway Trikes have including- Bar End Shifters, BB7 Brakes, Schwalbe Tires, Fenders, Rear Battery Rack, and Microsoft’s top of the line Marvo XE drivetrain components. Also included is the Dapu Geared Hub Motor System with both Throttle and 6 Power Assist Modes with a large LCD display, and a 36V 13 AH Samsung Cell Lithium Ion Battery that will give you a range of about 23 Miles Electric Only and about 60 miles per charge in the power assist modes.